Chicago, IL -- According to the American Society of Plastic Surgeons, the number of American women who have elected surgical breast augmentation has increased dramatically in the past few years. Their ranks swelled from 212,500 in 2000, when breast augmentation was the fourth most common type of plastic surgery, to 347,524 in 2007, by which time breast augmentation had become the single most common type of plastic surgery performed in the United States. Unrelated to their cosmetic surgery, many of these women will later face breast cancer, says Robert Kuske, a clinical professor at the University of Arizona Health Sciences Center and radiation oncologist at Arizona Oncology Services in Scottsdale, AZ. The augmentation surgery does not raise or lower a woman's chances of developing breast cancer, but because breast cancer is so common, tens of thousands of women who undergo augmentation each year will develop breast cancer sometime in their lifetime. The National Cancer Institute estimates about 1 in 8 of all U.S. women will be diagnosed with breast cancer in their lifetimes. 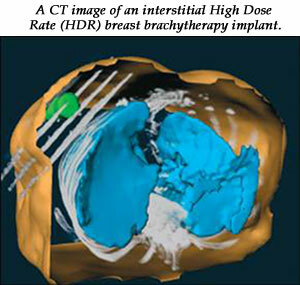 Having implants may affect the "cosmetic outcome" of breast cancer therapy. Traditional breast cancer therapy may include radiation therapy, which can expose the whole breast (including the implants) to radiation. One unwanted side effect that often occurs is that scar tissue can form around the implants, causing them to harden. In fact, says Kuske, about 55 percent of women with breast implants experience unwanted hardening of their implants after undergoing traditional whole-breast irradiation. At the annual meeting of the Radiological Society of North America (RSNA) in Chicago last week,, Kuske presented the results of a clinical study examining the technique known as brachytherapy for treating breast cancer while sparing implants. 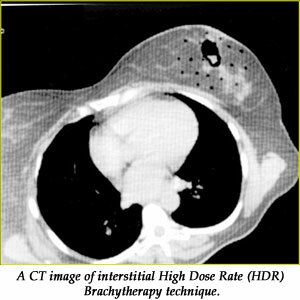 Brachytherapy kills cancer cells by exposing them to radiation delivered within a tissue. Basically, thin plastic catheters are inserted into a breast in the area of the tissue surrounding a cancerous site, and then tiny "seeds" containing a small quantity of radioactive iridium-192 are inserted into the catheters. This technique has been studied for years in women without breast implants, says Kuske, but his study is the first to specifically look at its ability to treat women with breast implants and provide better cosmetic outcomes. From June 2003 to June 2008, Kuske and his colleagues performed this treatment on 70 women, all of whom had breast augmentation and early-stage breast cancer. After these women had tumor masses removed via lumpectomy, they were administered brachytherapy for one week to kill the remaining cancer cells. 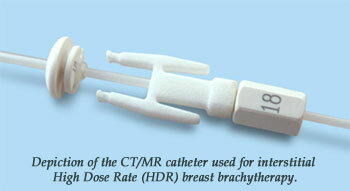 The study showed that brachytherapy is effective at treating the cancer while sparing the implants. Kuske found that implant hardening was reduced to zero. "This study looks very promising in that brachytherapy seems to improve the cosmetic outcome for women who have had implants," says John C. Roeske, PhD, a professor of radiation oncology and Director of Radiation Physics at Loyola University Medical Center in Chicago who was not involved with the study. "However the results are very preliminary, and we should proceed cautiously. In particular, it will be important to critically examine the long-term results and follow-up of these patients." This story is provided for media use by the Inside Science News Service, which is supported by the American Institute of Physics, a not-for-profit publisher of scientific journals. Please credit ISNS. Contact: Jim Dawson, news editor, at jdawson@aip.org.